Eating Indian food can involve a level of ceremony. As teeming balti dishes of vindaloo and biryani are placed alongside baskets of paratha—in rhythm one after the other—diners methodically load and share in silence, communicating mostly by pointing a finger at a serving, indicating that it’s time for that one. The finale commences at the register. That’s when very tiny beans of sugar are shoveled from a very tiny dish with a spoon the size of a pinky nail. The hyper white, pink, yellow, and orange sugar-coated fennel seeds have the look and licorice-like taste of candy—like micro Good & Plentys—and, at their most basic, are similar to the wrapped peppermint candy you pocket on your way out of a greasy spoon. But what are their origins? And what’s their present role in Indian cuisine? 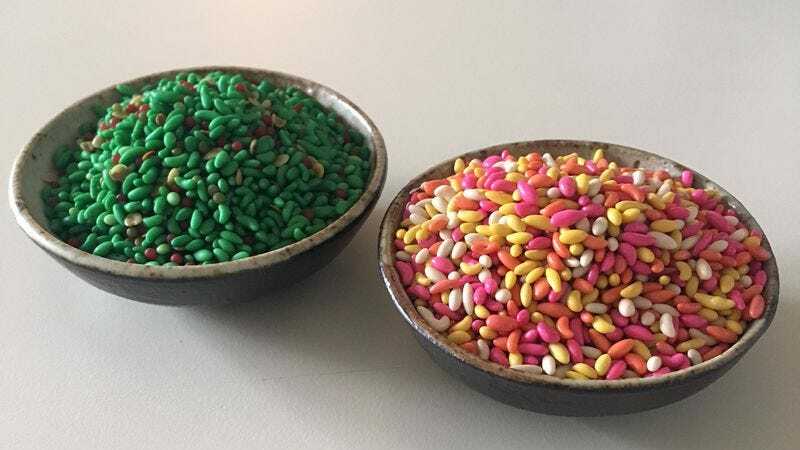 Composed solely of sugar, fennel, and a couple food dyes, the sugar-coated seeds resemble the entry-level ancestor of mukhwas. Mukhwas are a similar type of treat, but one more complex in construction and goal. In addition to sweetening the breath and cleansing the palate, they’re also helpful in digestion (the fennel seed herb is traditionally known to relieve gas). Essentially, you’re sort of combining the effects of a bottle of Underberg and a few slivers of pickled ginger into seed form. The basic Swad brand of mukhwas found at Indian grocers includes roasted coriander (dhana dal), sugar ball (jintan), sesame seeds, and chanothi leaves, which are described by the label as “Indian Liquorice.” They have a more pungent scent than their simplified counterpart, featuring a bit of sweet-mint heat and perfume-like flavor that permeates and clears your nasal cavity. The floral spice of mukhwas attaches to the back of your tongue like the smell of your grandmother’s potpourri attaches itself to your clothing. Colleen Taylor Sen, writer of Feasts And Fasts: A History Of Food In India, elaborates on the origins of mukhwas, believing they were born from the consumption of supari, or betel nuts, which became widely used as breath fresheners in the courts of Islamic rulers in Delhi in the 13th and 14th centuries. Popular as an ingredient in paan, betel nuts are not proper nuts but the seed of the areca palm and categorized as berries. It’s served at the end of the meal, like mukhwas, and it helps produce saliva while also conceivably aiding gastrointestinal progress and freshening the mouth. It all sounds very healthy—although, chewing on betel nuts has also been tied to an increased risk of mouth and esophageal cancer. Both O’Brien and Sen acknowledge that, because mukhwas are omnipresent in Indian-food culture, their historical lineage can be easy to overlook. Neither could speak much to the candy’s introduction as a part of the restaurant experience, though there are undoubtedly several spots that trumpet the use of fennel seeds—or at least, provide an explanation as to their purpose. Whether descendants of comfits or supari or both, candy-coated fennel seeds have become an essential flourish to an Indian establishment’s decor, a welcome tweak to its luster. Besides, considering the rich amounts of spice, cream, and fried deliciousness you’ve consumed, there’s not much harm in piling a tiny handful of seeds into your palm and knocking them back on your way out the door.